The plastic ban is a lost opportunity to simultaneously impact the environment, while strengthening local innovation networks and mitigating the disruption to industry. Starting on Gudi Padwa (March 18) 2018 (viz. the traditional New Year), the Maharashtra government issued a notification effectively banning the use of plastic and thermocole products. The notification justifies this ban based on the problems caused by non-biodegradable plastic, especially that with a short use life: clogging of drains, danger to marine life and diversity, accumulation in the environment and implications for health. Plastic packaging for medicines will be allowed. Milk pouches have not been banned – however, each such bag will need to have a buy back price printed on it and (by June 2018) the government plans to have a mechanism in place for collection. Here, I do not intend to explore the merits of this ban, or its implementation. Rather, this is inspired by something I saw on my routine Sunday morning visit to the supermarket to pick up my weekly supplies. Given the prevalence of plastic packaging material, I had been wondering about how society and local businesses would cope with the impact of this ban. A recent newspaper article quotes the All India Plastics Manufacturer’s Association and states an estimate of about 4,00,000 jobs lost due to this ban. The State government has entrusted local government, municipalities, etc with enforcing compliance to the ban. This is likely to be challenging given that most local government bodies are already stretched for resources and might not be able to keep track of and identify repeat offenders (as is required by the new law). What might happen, at least in the short term, is that small businesses such as the neighbourhood kirana store will resist giving up their “polybags” and might seek ways of “managing” the system (passing on the associated costs to the consumer). They will probably adopt a wait and watch attitude, as the State government deals with the legal challenges that the ban will inevitably attract. This article does not intend to explore this aspect either. What I was wondering about when I went shopping this morning is how large organized supermarket chains who are equally reliant on plastic packaging (and who cannot use the same strategies as smaller kirana stores to manage the ban) would deal with this disruption. My interest in this issue is possibly keener than for others since I work on plastics, and have advised our city municipal corporation on issues relating to waste disposal. Therefore, I am aware of the volume and problems caused by plastic packaging. And, I am equally aware of the (low) cost and difficult-to-match properties of polyethylene (LLDPE) that make it the dominant material for film packaging applications (see: here and here). So, it is clear to me that regulation must and will have a role to play in forcing a change. But I digress. What I saw when I went to the supermarket is that they had adopted a non-polyethylene, biodegradable bag (see image below). These bags are manufactured and supplied by a Gujarat based company, using a material called Biolice®. Biolice is bio-derived and is a biodegradable film-forming material developed in France by Limagrain. This marketing video claims that these are prepared from non-food sources (though some of its own literature claims that it is derived from maize flour). Limagrain’s website describes it a cooperative group founded and directed by (presumably French) farmers. They appear to have done extensive focused research to value add to farm products, as is evident from the nearly 90 patents assigned to them. There are few alternatives that match the tear strength of polyethylene packaging films, but I was fairly impressed with the bags that I saw this morning. So, all-in-all, a wonderful technological innovation that appears to have made the transition from the laboratory to production in China and to actual use in a supermarket. So, why was I disconcerted by my experience this morning? Mainly because I saw in this, a lost opportunity to simultaneously impact the environment, while strengthening local innovation networks and mitigating the disruption to industry. 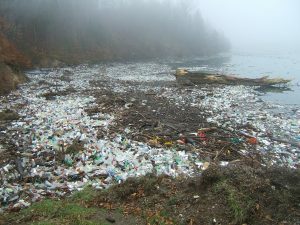 Imagine an alternative scenario where a major state government decides on implementing a ban on plastic packaging, and realizing that there aren’t many viable alternatives to the polyethylene, approaches (say) the Department of Science and Technology and works with them to provide focused funding to the development of alternatives within a defined time frame. The DST, in collaboration with the State Innovation Council, the Science and Engineering Academies and industry bodies like Confederation of Indian Industry (CII), puts out a call for proposals and actively solicits proposals from institutions with the necessary expertise. Research and radical innovation to develop an alternative with polyethylene-like properties might not happen in a year (note that Limagrain’s patents have priority dates going back to 2000 and earlier). However, given a pressing need (for example, an imminent ban), and given funding to develop a product and industry ready to take it up (a Manhattan project kind of scenario? ), could a meaningful alternative emerge? Perhaps, based on a local raw material such as bagasse (that is currently burned in co-generation plants)? What are the elements missing for something like this to happen? Milind Sohoni has argued for Indian academia to better appreciate local challenges, and for better coordination/cooperation(?) with local policy makers. Atul Bhatia has made the case that the time is ripe to establish collaborations between academia and industry. To me, it seems like here was an opportunity to make all this happen in the context of an important societal problem. Careful planning and orchestration of this change would have lessened the pain of the disruption due to this ban, while building partnerships that would strengthen innovation chains (between government, academia and industry). How do we make this happen the next time around? Will the science/engineering academies and industry bodies collaborate and put in place a joint panel with the explicit mandate for building these links? Thank you for sharing your article. Firstly, I welcome the step by the state government. Although, as you have stated around 4 lakh people lost their jobs so it could have been planned well. The job loss shows lack of collaboration between the state government and manufacturers of plastic bags. The transition phase should have had an altenative in place before imposing the ban. Further, as mentioned by you, there is a need to encourage innovations at grassroot level. A potential alternative to plastic bag could have been crop/agricultural residues derived bags. Locally sourcing the raw materials could have reduced prices, management of waste and lastly created new jobs at farm level and across the supply chain. The plastic ban could have paved a perfect example towards how government can promote sustainable and circular economies.